Do you see the lady bug in my wrist? I took that shot during Easter celebration last year. was wearing my favorite watch among the three that Mr. K has given me when I was still in Pinas. I only wear a watch whenever we are going somewhere. I know some people that cannot go without a watch. To them, it is a part of their daily get up. How about you? Thanks a lot for joining this week! Please leave a comment after linking. I definitely can't leave the house without my watch and earrings, hehe. It's as if there's something lacking. I love to match the accessories with my outfit: color and style. Thanks for publishing my Link Rose. Kagigising ko lang, hehe. Nice watches! 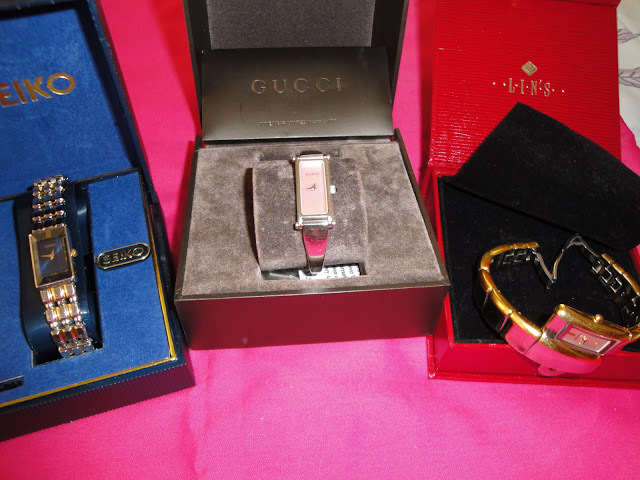 I love watches and jewelries but I don't wear them often, only during special occasion. nakakatakot kasi mgnanakaw dito, hehe. re:thanks for a very warm message sa Kizuna^_^love yah! love the card, rose. it arrived this morning. in an era where snail mail is falling into antiquity, receiving one is PURE BLISS! thanks, thanks...im at a loss for words...just mwahhh and best regards always, esp. your beautiful family. I used to wear my watch whenever I go out, but since it was broken, don't have any watch anymore sigh. Yay! Mamahalin pala watch mo ha and you like square ones. :) Joining nostalgia sis. Sorry hindi ako nakapag blog hop masyado this week, had a bad flu that I got from Hubbz and George. I don't wear one..haha! I remember though during my younger years that I too cannot go out without one in my wrist. Here's my entry hehe! Thanks and see you around. ayay! bongga ka talaga badingding...pede sanla natin yang iba sa MLhuiller...ehehhee...joke! hanggang tingin lang ako...I wear watch sometimes, but not at all times. Nice watch you've got there. any way, hope you can check mine at www.3outof4.com :) good day! ay ako hindi rin mahilig sa relo.. pero if may magbibigay welcome na welcome..hehehe..
my nostalgia is up..late na si ako sa nostalgia..
ako meron.. pero mumurahin lang.. hehehe... ngayong lang comment.. absent kasi si blogger nung napost ako ng link.. Nag down kasi ang Blogger kaenez hanggang sa nakalimutan ko na. Di bale, next week nalang ulit ako bawi mommy.